People who find themselves dealing with a Bergamasco for the first time, are generally worried about taking care of its coat. One of the erroneous conceptions is that Bergamascos should never be brushed to avoid disturbing the maps. Once these are properly formed, no amount of brushing can alter their internal structure. Brushing is necessary in order to tidy the coat and to remove dirt. Another false belief is that Bergamascos should never be washed. Frequent baths are no more detrimental to the Bergamasco's coat than they are to the coats of other breeds. The use of shampoo is not recommended as it dissolves the natural oils secreted by the skin for the purpose of creating a protective film around the hairs to make them waterproof and protect them from the contact with any external agents. Without this protection, the coat would become dirtier and the skin would dry out . A good rule for Bergamascos is not to give them a complete bath more than once or maximum twice a year. They should be washed in plenty of water with only a very small dose of detergent. If necessary, one can wash the parts of the body which tend to get dirty easily at more frequent intervals i.e. the extremities of the maps, around the mouth to remove food remnants. Again, use plenty of water and very little soap. Another piece of advice is to avoid the use of a hairdryer unless absolutely essential. This dries out the hairs with the consequences we have already discussed. In practice, the Bergamasco's coat needs little care, but applied at the right moment. For more detailed information on grooming, click on the left and search the section entitled: Coat. This phenomenon is important when studying the coat of the Bergamasco. When examining the maps of the Bergamasco one wonders how this kind of dog moults, since these hair masses grow longer and longer year by year, do not renew themselves and always remain the same in the dog's coat. From this one could deduce that the woolly hair which is the matrix foundation of the maps moults only very slightly each year, in comparison with the other hair types. In the event that this type of coat were to undergo radical moulting, the hairs at the base of the maps would also fall out. In this case, the maps would sooner or later fall out, but this doesn't happen. In a healthy coat, the map bases are always sound. During the moulting period, one can see that the undercoat and goat hair in the saddle becomes thinner, whereas the maps never fall out. The Bergamasco's coat is also subjected to felting so when the undercoat and goat hair moult tangle with the woolly hair and the three types of hair entangle to form a single unit. So also in the shedding time only few hairs will be louse and fall on the ground and are easy to remove from carpet and clothing, even more than the short prickling hairs of the shorter coated breeds, whose coats are erroneously thought to be easier to deal with. The coat of Bergamasco evolved to protect him from the elements in his work as a herding dog. The felt-like maps protect the dog from cold and heat and form a natural raincoat which prevent water from coming into contact with the skin. Moreover this thick coat shelters the dog from bites of snakes and insects. The thick curtain of coat that covers their eyes as well has a functional purpose: it serves as a visor, so as not to be dazzled by the sun reflecting off snow in the mountains. It also allows the dog to look at in any direction, even towards the sun. Furthermore the maps on the Bergamasco grow very slowly so that a shaved dog will have a right coat never again. Anyone who wants to own a Bergamasco should be aware of the characteristics of the breed which cannot be modified at whim without running the danger of destroying a heritage passed down to us over thousands of years of functional selection. How behaves the Bergamasco towards the family? The Bergamasco is a family dog in the true sense of the word. It does not select a particular individual to whom it is dedicated, it doesn't want a "master" as is the case for many other breeds. Thanks to its great sensibility, it behaves in a slightly different manner towards each of the members, adapting to their personal characters and acting accordingly. Attentive and reserved, it participates constantly in everything which goes on around it and, even when it appears to be asleep, its eyes will be following you, because it always wants to know where you are and what you are up to. In this way, the Bergamasco becomes a member of your family without you really noticing it. If you are separated from it for one day, you will catch yourself looking round in search of it looking at you and you will then realise how important its presence has become for you. Its relationship to children is something special. Patient, tolerant, attentive and protective, it seeks their company, encouraging their games and treating them with a very particular kind of politeness and delicacy, thus establishing true friendship with them. Anyone who owns a Bergamasco is also lucky enough to have an excellent Nanny on hand, apart from feeling protected, loved and safe at all times. What ist the right obedience training for Bergamasco? Friendly, affectionate and spontaneously obedient because it is the one looking for connection, the Bergamasco will never blindly execute orders. It is impossible to make a robot out of it. If you try to apply the training methods which are popular at the moment and which work well with other breeds, you will not get very far. It will look questionably at you, trying to understand what is going through your head and, if you cannot come up to its expectations, based on its intelligence and common sense, it will simply walk off, bored, disillusioned and, maybe, even offended. It always needs to understand "why" it has to do something. A Bergamasco needs to be treated as the intelligent being which it is: only if you can make it understand "rationally" what you want of it, will it comply with pleasure but, in its own way. Is the Bergamasco protective of the home and family? Nowadays some people find satisfaction in the possession of an aggressive dog which, whether rightly or wrongly, induces fear. Who are specifically looking for this type of dog may want to consider another breed. Bergamasco is a flock drover and, to make it suitable for this work, a careful selection was applied to eliminate excessive aggressiveness, a highly negative trait in this case. Although not instinctively aggressive, the Bergamasco is an excellent watch dog because it doesn't like strangers invading its world and energetically expresses this aversion by preventing them from stepping over the boundaries of "its" property. His sheer size and the barking he will provide is protective in and of itself. Bergamascos are generally calm dogs, but are happy to join their owners in any activity. A daily walk should be essential. This can be accomplished by playing ball, a free run in a meadow, but not alone, he likes interaction. Bergamasco is the best of friends for trips, particularly in the mountains. What sort of climate do they live in? This is an important consideration for the sake of the dog and really is just common sense. 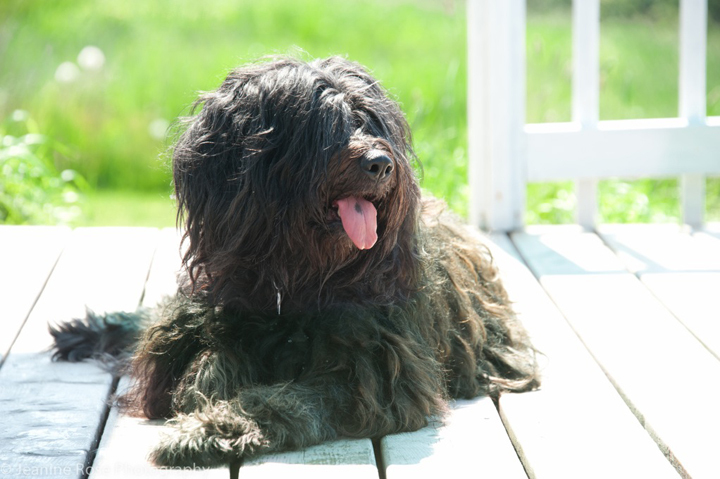 Most breeds, as Bergamasco, that originate in cold climates, have very thick coats and will suffer terribly in very hot conditions. If you have a climate controlled house or kennel where the dog will spend most of its time, this may not be such a problem.